Preheat oven to 325°F. Using an electric mixer, beat butter, sugar and brown sugar in a large bowl until light and creamy. Add eggs and vanilla; mix well, scraping the sides and bottom of the bowl. Place flour, baking soda and salt in small mixing bowl and mix with wire whisk; stir into butter mixture, scraping sides of bowl as needed. Stir in chocolate chips until well mixed. Prepare 3 large baking sheets by lightly greasing with butter, or spray with non-stick vegetable spray. Scoop the cookie dough into 24 mounds (about 3 tablespoons each), arranging them about 3 inches apart. Bake until cookies are flat and very light golden brown, about 20 minutes. Cool; place cookies in the freezer until they are very cold. Arrange 12 cookies flat-side up on a large baking sheet. Scoop 1/2 to 3/4 cup of vanilla bean ice cream on each cookie and press a second cookie, flat-side down, on top. Smooth the edges so the ice cream is even with the edges of the cookies. Freeze until ice cream is set (at least 2 hours). 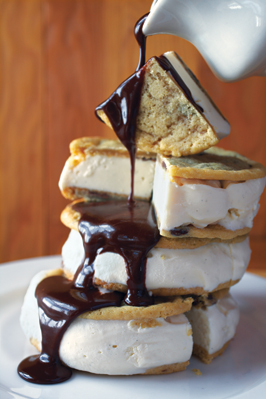 When the ice cream has set, cut each sandwich in 4 wedges and serve with Hot Fudge Sauce.